Television has gotten good in the past few years - so good that many original network and cable series are, on average, significantly better fare than the middling drivel Hollywood has produced lately (Meet the Spartans, Fools Gold, Prom Night, the list goes on). DVRs allow for record now: watch later while almost every series can be found on DVD mere months after the most recent season wraps. Most networks and the network-approved Hulu.com feature a back-log of recently aired episodes and older series to catch-up on with modest 30 second commercial breaks. Available episodes range from a handful of recent broadcasts to entire seasons' worth. Because of all of the above (and also the less legitimized Bittorrent), I have been able to keep up with favorite series and watch, marathon-style, the series I missed in primetime. 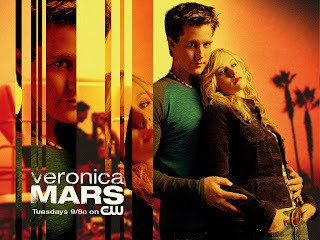 Enter Veronica Mars and a two-week, 64 episode marathon. The relatively short-lived UPN/CW mystery series was a critical darling and obsessive fan-favorite, but abysmal ratings (seriously low, low, ratings - the nadir of the networks) couldn't keep the series alive. Heroine is a petite, blonde highschooler (later college chic), formerly of the popular crowd but now an outcast. Heroine combines forces with other misfits to form "Scooby Gang" (only instead witches and chipped vampires it's computer geeks and biker gang leaders). Heroine helps people (slaying vs. solving crimes), including schoolmates who come to her for help despite her unsavory reputation. Series includes episode-contained plots (monster of the day vs mystery of the week), as well as overarching story lines. The teenage characters are far more witty and pop-culture savvy than actual people tend to be. From the first episode, the trajectory of season one is clearly set. High school junior Veronica Mars has a few problems. Her best friend Lilly Kane was murdered (and the wrong guy went to jail for it), her boyfriend unceremoniously dumped her, her mom skipped town, her father lost his job and the town's respect, her social standing has been obliterated, and to top it all off, she was roofie'd and raped at a party but doesn't know who did it. Fortunately for Veronica, she's no damsel in distress. Relentless and often bitchy to hide her vulnerable seventeen year-old self, Veronica is a smart, head-strong private investigator with a knack for solving mysteries, even as she tends to dig herself deeper into trouble. By the time the mysteries of season one are wrapping up, the more convoluted - and superior, IMO - season two is already underway. What is apparent is the reason why the series is so beloved and why comparisons to Buffy the Vampire Slayer are more than fair. Veronica Mars features a masterful combination of clever writing, teenage angst, unexpected twists, relevant themes, identifiable characters, humor, drama, and tragedy, all wrapped up in a slick, attractive 42-minute package. Joss Whedon may be the show's unabashed #1 fan, but I'm a happy new recruit, grateful both for quality television and the means by which I am able to watch 14 episodes in 12 hours, if the mood strikes.